Long time readers of this blog will be familiar with the strange case of James S. Valliant, former public prosecutor and author of the seriously loopy cult doorstop "The Passion of Ayn Rand's Critics", the more bizarre aspects of which we have already chronicled in some detail here, here, and here. Perhaps none too enamoured with our attitude to his nut-gone meisterwerk, Mr Valliant later launched a feeble attack on the ARCHNblog on a Rand-related thread over at Richard Dawkins' site, which was in turn firmly repelled. Since then we have, perhaps unsurprisingly, heard little from the fellow until while examining the recent warfare over Rand's Wikipedia entry (a story in itself) we came across discussion about the work of one Wiki contributor "IP 160". "IP 160" had made over 1300 edits in the past 6 months - and had become the single most prolific editor of the Ayn Rand entry, particularly notable for their "uncivil, rude, and disruptive" behaviour, repeated deletion of verifiable sources for the article and repeated reinsertion of references to one James S. Valliant and "The Passion of Ayn Rand's Critics" throughout that and other Rand-related Wiki articles. Busted. Seems rather churlish to be complaining in public how crappy Rand's Wiki entry is when you're in fact that entry's most crap-tastic contributor. Surely there are but minutes till his sockpuppetry as "Pelagius 1" is similarly sprung and Valliant's credibility-o-meter is reset permanently at zero. Stay tuned. Valliant was given access by Peikoff to previously unpublished original Rand materials, and Valliant is cited in the book 'Ayn Rand' by Jeff Britting the official Archivist at the Ayn Rand Institute. Valliant is not "cited" in the book. He is listed among a few dozen people in the "Acknowledgments" section. Britting's book came out in 2004 and thus could not have cited PARC. Pelagius1: "...Mr Valliant is asleep right now. I do live in the same house with him, but he'd rather I not do this at all..."
I have mentioned this post on OL. See here: http://www.objectivistliving.com/forums/index.php?s=&showtopic=6280&view=findpost&p=70192Sorry about copying the image to another server. The forum software does not permit embedding images using Blogger syntax. If there is any inconvenience, please let me know. Thanks Michael for your note. I like the Objectivist-Da-Vinci-Code conspiracy theorising that's going on, with Valliant's Wiki removal being called "censoring" and attributed on an typically fact-free basis to to the evil machinations of one Barbara Branden, despite Valliant's own blatant dissembling and sockpuppeteering being overwhelmingly evident as the cause of his demise. Hilarious! That Pelagius1 is Valliant's mom? with Valliant living in the basement? Daniel, what does this Valliant do for a living? I don't think he is even a smart crook. Had I been him, at least I would have got myself a cheap used laptop and pretend to be Pelagius1 from Starbucks. Valliant is yet another example of the failure of the Objectivist ethics. We can make the logical incoherencies and empirical shortcomings of Rand's moral notions as clear and palpable as the summer sun, but in the end what is most important is to the practical fruition of the doctrine. In Valliant's case we must assume that Rand's ethics has not exercised a morally salubrious affect on him: it has not made him a better person, but might very well have made him worse. If we naively assumed that conduct follows rigorously from theory, we might think Valliant a hypocrite. After all, isn't honesty and integrity among the most highly considered of all Objectivist virtues? And there is little if anything in Valliant behavior that so much as hints at honesty or integrity. Would Howard Roark have behaved in Valliant's fashion? It's hard to believe so. And yet another interpretation suggests itself as well, one which would remove the stain of hypocrisy from Valliant's conduct. It is also possible that the problem is in the Objectivist ethics itself, in the fact that it is vague and rationalistic and that one may deduce from it what one pleases. Valliant's behavior may not exhibit much in the way of honesty or integrity; but after all, these virtues are, according to Objectivist theory, mere "contextual" absolutes. There are some contexts where they don't apply at all. Yet Rand and her disciples are not very clear at distinguishing between those contexts where they apply and those contexts where they can be ignored. This allows ample room for the fine art of casuistry. And so the interpreter of these shining virtues will always find that, whenever he wishes to behave dishonestly or without the requisite integrity, the "context" of his situation will exquisitely fit the bent of his desires. Why blame Valliant's shortcomings on Objectivist ethics? Why not blame Valliant's shortcomings on Valliant? This is actually a slippery slope that leads to all kinds of mischief, including censorship if taken to the extreme. After studying some persuasion techniques (Robert Cialdini, Blair Warren and others), I fully agree that Objectvist ethics provides a useful tool for cult leaders to brainwash victims, just like Christianity, Islam, and other ethical systems do. But brainwashing is not inevitable and many good people follow all these systems. 5. They are hard for normal people to access. When looking at the Objectivist movement, doesn't this sound familiar? But I see nothing inherent and causal in the body of thought itself that leads to an evil or failed result in those who adopt the ideas. I, for one, use the Objectivist code of values and I do not consider myself to be brainwashed or even unreasonable. An idea is an idea is an idea. People brainwash people. Ideas don't. In Valliant's case, he obviously has a screw missing. I don't know if this came from brainwashing or from being just plain boneheaded or both. I suspect being just plain boneheaded with an intellectual "push" (not a full-fledged brainwash) from orthodox insiders. I believe if Valliant had been attracted to any other system of ethics when he was younger, he would have turned out just the same as now. Here's a thought if you want something inherent in Objectivism to bash. Maybe there is something hidden in the Objectivist vision that acts like a spiritual dog-whistle attracting these lost souls, but emitting a sound others can't hear. Something along autistic lines with a nasty, lonely, underachieving, self-pitying nature hidden by hubris and a stubborn insistence on being right when wrong. These people are not among the majority of Objectivists or Objectivism-friendly people I have met, but I know there are enough of them to make a pattern. And I know I am getting sick to death of them. I believe that it is more accurate to say that Valliant's wikipedia kurfluffle is yet another example of the failure of Valliant's ethics. Michael: "I know you didn't use the word 'brainwash,' but from my understanding of your critique, this is the inevitable result you imply that is inherent in Objectivist ethics." You're right, I don't use the term brainwash, and for good reason: I don't think that's what's happening. My criticism is more in the other direction—i.e., that the Objectivist ethics doesn't have much effect at all except to give people like Valliant a good conscience to do what he would have done in any case. That's why I describe the view that people follow ethical theories as naive. What they do, instead, is follow their personal sentiments and then use casuistry to align their favorite moral theory with their conduct. My criticism, then, was not meant to suggest that Valliant is a victim of cult-like brainwashing turning him into some kind of Objectivist zombie. On the contrary, if he was an Objectivist zombie, wouldn't he try to be more like Howard Roark and less like Peter Keating? The failure of the Objectivist ethics, in Valliant's case, is that it has seemed to have no effect on his conduct at all, unless it has inspired him to engage in adept causistry. Wells: "I believe that it is more accurate to say that Valliant's wikipedia kurfluffle is yet another example of the failure of Valliant's ethics." 1) That all these folks were rotten to begin with and the Objectivist ethics could therefore have no affect on them. 2) That the Objectivist ethics may have had an effect on them initially, but that effect somehow wore off over time. In either case, Objectivism has a problem. In the first case, we have wonder what it is about Objectivism that attracts so many rotten people. In the second case, we have to wonder why so many people abandon the Objectivist ethics after a time. I think my explanation is the most plausible of all: that the Objectivist ethics has little effect on people beyond simply to reinforce the tendency to indulge in causistry and make individuals think better of themselves than they deserve. Actually, pretty much every Objectivist I've met both in real life and online were exactly that. ...with you being the exception. Thank you for clarifying that. I still have an issue. You wrote: "My criticism is more in the other direction—i.e., that the Objectivist ethics doesn't have much effect at all except to give people like Valliant a good conscience to do what he would have done in any case. "So what about people who are not like Valliant? Have you never met any in the Objectivist world? You also wrote: "I think my explanation is the most plausible of all: that the Objectivist ethics has little effect on people beyond simply to reinforce the tendency to indulge in causistry and make individuals think better of themselves than they deserve. "Once again, I notice that you only mention people who have been problematic and/or manipulative. If that is the only group you are going to analyze, your explanation actually holds true for any-and-all ethical systems. I do not know of any ethical system that does not have people who do problematic and/or manipulative things among the higher-ups practicing it. Do you? Or do you think Objectivism has a monopoly on people who do problematic and/or manipulative things? If your last comment were restated as follows, I would 100% agree with it: "I think my explanation is the most plausible of all: that ethics in general has little effect on people who do problematic and/or manipulative things beyond simply to reinforce the tendency to indulge in causistry and make individuals think better of themselves than they deserve. "In fact, this sounds so true, I can even imagine people going off to fight wars and doing horrible things to people they don't even know in the name of ethical systems that make them "think better of themselves than they deserve." I can even imagine both sides of a war thinking like that. Now here's a rub. If you are going to analyze a system of thought and ignore people who successfully use the principles, this causes serious problems for your argument. In my own intellectual life, unlike the trend on Objectivist forums, I wouldn't think of bashing Christianity, for example, without looking first at the good people who are Christians. The fact that I do this instead of scapegoating the category makes me not too popular with individuals of a more dogmatic bent. Any thoughts on how good people can exist who follow Objectivist principles if your explanation is the correct one? Believe me, they exist in droves. For example, if you had attended the Atlas Shrugged 50 years celebration and you would have met oodles of them. I think Valliant's behavior can be understood by reading Murray Rothbard's famous essay, "The Sociology of the Ayn Rand Cult." Rothbard's main point was that Objectivism has both an exoteric doctrine and an esoteric doctrine. The exoteric (public) doctrine is all the stuff in Galt's speech, etc., which includes celebrations of honesty, integrity, and rationality. 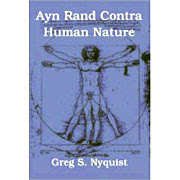 The esoteric (hidden) doctrine is: "Ayn Rand is the greatest human being who has ever lived." Rothbard was writing about what we would now call "orthodox" or ARI Objectivism, and his analysis may not apply to the Kellyite version, which didn't exist at the time. Valliant, in using any and all methods to defend Rand's honor, is simply being true to the central, esoteric doctrine of the ARI. What matters above all is keeping Rand on a pedestal. Anything that undermines her reputation must be fought with all the weapons at one's disposal. Sock-puppetry may be unethical, but it is an easily pardonable sin in the context of defending "the greatest human being who has ever lived." I believe this is how Valliant and other orthodox Objectivists rationalize their behavior. They may not use precisely those words - they may say, "Ayn Rand is essential to saving civilization," or "Ayn Rand's achievements are so great that any criticism is irrelevant" - but the bottom line is that the end justifies the means. The end is keeping Rand's image pure. The means is ... whatever it takes. BTW, Michael Stuart Kelly's dog-whistle comment was terrific. Having dealt with Valliant on and off-line for 3 years, I think Michael Kelly is right that the guy has a screw missing. A more interesting question is why someone such as Leonard Peikoff -- who obviously knows there is a lot more truth to the Brandens' account of Rand then he has publicly admitted -- would 'task' Valliant with the job of defending Rand, particulary having read what has become the first part of PARC (which is the subject of my critique). And why do Objectivists such as Peikoff lie about Rand, for example his 2006 claim that he and Rand quit smoking when they became convinced that smoking caused cancer; in fact Rand quit in her doctor's office having learned that she had cancer. I'm working on something on this, and I don't have a good answer. Perhaps many Objectivists are insecure and believe that if Rand couldn't live up to such exalted standards, then what hope is there for anyone else. Michael: "Once again, I notice that you only mention people who have been problematic and/or manipulative. If that is the only group you are going to analyze, your explanation actually holds true for any-and-all ethical systems." "Any thoughts on how good people can exist who follow Objectivist principles if your explanation is the correct one?" Well, just as I believe that Objectivist ethics only intensifies what is already there in the case of people with questionable morals, I suspect the same thing happens in the opposite direction with a good person. That is, the Objectivist morality (and, indeed, morality in general) will tend to intensify their goodness, by giving a logical varnish to what originates in their sentiments. Now I have no scientific information concerning the moral demographics of the Objectivist population. But among the orthodox, I have either known or known of a great many who, while not being particularly nasty or evil, nevertheless are morally challenged. I would not do business with any of these folks or give them any kind of mission of trust. And I do tend to suspect that, to the extent that these people are influenced by Rand, this influence has exercised a deleterious effect on their character. Generally speaking, it's not a good idea to encourage people to be proud and selfish, and to suggest to them that people who expound rival philosophies are irrational and evil. Now I realize there may exist exceptions to this: Objectivists (particularly neo-Objectivists) who are not made worse by these doctrines. But within the orthodox fold, how common are such exceptions? I can only think of a few exceptions, while I can think of many more who are not exceptions. There is something to Greg's comments and this is the simplest way I can put it: any ethics that doesn't promote sufficient regard for the welfare of others is a lousy ethics for grooming good people. As Red Grant might ask: "Good according to who?" And I would answer: good to me. I would be very wary of someone who is explicitly professing to looking out for number one in social circumstances. Sometimes, the atheists in the foxholes joke has a point. I agree with Greg as far as not giving too much confidence to "orthodox" Objectivists with any mission of importance as I see it (unless it is a matter of using them as unwitting cannon fodders or useful idiots). However, let me qualify what Greg called "morally challenged". I would rather call it "self-awareness challenged". their intellectual masturbation, that there is a great disparity between what they think they believe and what they actually believe, and what they think they are capable of, and what they are actually capable of, and their unwillingness even to try to find out how much discrepency exists between their self-perception of their character and their abilities and their "actual" character and capabilities based on empirical evidence. Now, to be fair, "Orthodox" Objectivists are not the only one who are guilty of this. Christian Fundos, "Muslim" Fundos, ditto heads, and at least some of the left-wing variety "intellectuals" are just as guilty when it comes to being "Self-awareness challenged". While I do not necessarily disagree with what I consider to be your sentiment in your statements, there is a room for further clairification. Should one care about the welfare of others who do not and will not care about those who do? Does this mean then you believe the concept of good is relative? Red: "I agree with Greg as far as not giving too much confidence to 'orthodox' Objectivists with any mission of importance as I see it (unless it is a matter of using them as unwitting cannon fodders or useful idiots)." I'm not sure I'd go so far as to wish to make cannon fodder of Objectivists. Let's keep some perspective on this. We're not talking about people who are, in the main, particularly vicious or evil. Although I would recommend being on one's guard against such people, I don't personally regard them as objects of contempt. They are merely boorishly self-absorbed—like much of the human race. They are objects of pity; I do not wish them any ill. If I mistrust them, it is not so much because I think they are dishonest but because I suspect that they don't even know what it means to be honest. Self-ignorance and self-presumption (as Red suggested) are the problems of such individuals: and alas Rand, with her narcissistic naivete about human nature, didn't place in her ethics any effective counter measures against these congenital failings of mankind; so instead of helping them get over such failings, the Objectivists ethics, to the extent that it has any affect at all, simply reaffirms the bad old tendencies that were there from the start. Moreover, I rather doubt that, in the role of idiots, the orthodox Objectivist would ever be found very useful; and as cannon fodder, it would be a dreadful nussiance keeping them from running away. Hey! Great to see you again. Of all the explanations that are offered for Valliant's motives (including his own), I had not thought of it the way you presented. I was on a "worship Rand" idea for his principal motivation, not "greatest human being" as the real hidden message. It's subtle, but there is a difference. Leaving aside the just plain boneheaded nature of this dude, I think you nailed it. I think any answer presented will be subject to criticisms similar to those with Pareto gave Kant, so the real question here is whether, in an empirical fashion, Objectivism promotes some compassion for the limitations inherent in human beings. Of course, the specifics of whether you decide to be compassionate in this or that context are always open to objection in specific circumstances, but while you might find a Christian or Jewish egoist, you'll be hard pressed to find an Objectivist humanitarian. For the most part I do, though I know that expressions of such judgments are not always intended to be relative. You should study Sun Tzu, especially on the chapter dealing with espionage. Orthodox Objectivists could be very useful as agents to be sacrifised. In fact, take a look at "The Prince" where an example could be found to applied to orthdox Objectivists as a useful idiot. Red Grant: "You should study Sun Tzu, especially on the chapter dealing with espionage. Orthodox Objectivists could be very useful as agents to be sacrifised." Take The Atlas Shrugged Pledge! Is "Concept Formation" Empirically Testable?